Lest anyone forget, Bill Cosby is still a comic. "I'm going down there to make people laugh," he told The Root, a few days prior to a mid-January performance for a North Carolina audience that is paying to hear Cosby's comedy. From his Massachusetts home, he was winding down an almost hourlong conversation in which he mentioned his newest book of humor, I Didn't Ask to Be Born (but I'm Glad I Was), but mainly continued his unabashed critique of what ails some parts of black America, which has put Cosby in the headlines and, with certain critics, in hot water. "These are liniment salesmen," he said, dismissing the critics, including some fairly famous black ones. "They're selling things for their own good. It doesn't make any difference [to the salesmen] if people are getting well or not." His public pointedness about the travails of black people, who account for some of the worst statistical markers of life in America, is no different from what many a black preacher says on any given Sunday. It's what an average black person on the block routinely says to a neighbor, Cosby said. For his own part, he has been disavowing black-on-black crime, lambasting disproportionately low black academic performance and workplace strides, and the failure of some blacks to call black dysfunction what it is and then set out to correct it. "I don't know how many decades ago it was, but I remember Jesse Jackson saying 'babies having babies' … We really did not address the psychology of this. We were busy trying not to offend the teenager, to scar the teenager for life," Cosby said. Until an uptick in 2006, the black teen birth rate (pdf) had declined by 45 percent during the prior decade. But babies born to black teens, along with Latino teens, still disproportionately outpace the figure for whites. The manifold consequences of these facts are staring black America in its face right now, Cosby said. His 75th birthday is in July. Aging, life experience and his involvement in various public endeavors — whether as a barrier-breaking, Emmy-winning TV producer or as a philanthropist — have heightened his determination to speak up. 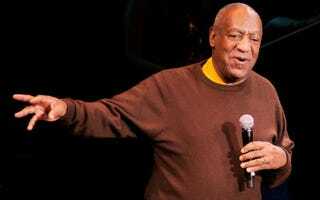 Though several prominent commentators have accused Cosby of blaming a black underclass for its troubles, the comedian said, his dead-on tackling of those issues is part of a longer-standing black tradition. "As a child, if you do something that doesn't match up with what you were being disciplined to do, you hear somebody say, 'You know, I worry about you sometimes.' It was their way of asking, 'Is this child really going to be able to make it in life, or is he as crazy as he's acting right now?' " said Cosby, born to native Virginians and reared in a public housing project in Philadelphia. "The key word was 'sometimes,' " added Cosby, as he rolled out those classic admonitions from his own childhood. The fuller sentiment suggested that, with loving support and correction, even a misbehaving child might have a solid adulthood. He continued: "But I'm telling you that I'm worried and very, very concerned today when a mother, speaking about the son being in jail, says, 'I'm happy. He's in a safe place.' You cannot take that casually." That mother's assertion is emblematic of the powerlessness, surrender and defeat explored in Come On, People, a 2007 tome co-authored by Harvard Medical School psychiatrist Dr. Alvin Poussaint and Cosby, who earned a doctorate in education from the University of Massachusetts in 1976. Come On, People, released after Cosby's various May 2004 observations about poor blacks drew a backlash, takes on the lack of black self-empowerment and related topics. Some commentators argued that his strident observations lacked empathy. Some faulted him for airing blacks' "dirty laundry." "The dirty laundry is reported with the murders," Cosby said. "I want the murders stopped. I want the children stopped from dropping out on their education … If you cannot read or write, you're going to wind up having difficulty getting a job. You'll find yourself being of low value to yourself." That fight was against a different "enemy," he said. "Governors, mayors, presidents, secretaries of state" and, broadly, Jim Crow. Black people led the charge that undid Jim Crow, and that's an essential lesson, Cosby said. That history is so important to him that he notes in his book some who helped make it. The name of civil rights icon Dorothy Height is the first on the acknowledgments page of I Didn't Ask to Be Born. "John Hope Franklin … Write his name down," he said, adding the noted historian to his own short list of important blacks. Cosby's proclamations these days are grounded in his hope for black America, he said. "I'm optimistic because there are people out there working. I'm working and working." He mentioned a project to keep young blacks out of jail in New Haven, Conn., which has one of the nation's highest black-on-black murder rates. He's glad that one of two young black men he recently met through that program is making his way forward. The other is back in prison. The comedian also highlighted a recent trip to Greenwood, Miss., where, he said, historically black Rust College is still molding minds, but the black businesses that once thrived nearby have largely disappeared. "People will say to me your words are very harsh," Cosby said. "They're certainly not as harsh as a [drug dealer] shooting another [drug dealer] boy and blowing his brains out over [territory]. Not as harsh as the stray bullet that paralyzes a 9-year-old child playing somewhere … This is not a prediction anybody could see coming." Changing the situation demands a concerted, communal effort, Cosby said. "Yes, Obama runs for president and people jump up and want to vote. But [many of them] don't vote for the mayor or the dogcatcher and the school superintendent," Cosby said. "We want more activism, so the people take charge in the neighborhood. As I've been saying, the revolution starts in your own house." Katti Gray is a Brooklyn, N.Y.-based freelance writer.